I’ve lost the last couple of days to flu — nothing serious, but Sirem has been very patient with the usual tragic man-flu whining. So this seems like a good moment to take stock with a progress report. Currently, the kitchen is our big priority. As usual we’ve sat down with Sketchup to figure out what we want to build. Because the room is not that big, and there’s only the one door, we’ve found it much easier than when we designed our kitchen in Southampton. Basically the strategy is to build as much worktop space as possible and then to cover every available bit of wall with cupboards. Nobody ever complained that their kitchen had too much storage space, right? 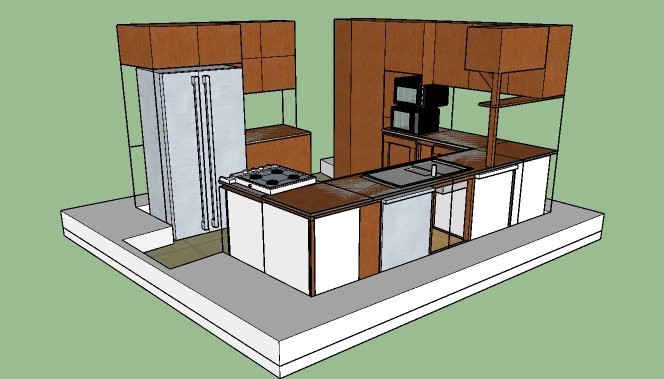 Planned kitchen layout in Sketchup. The door is at the back of the picture, and that slot on the front left wall is an old fireplace where we plan to keep the gas bottles for the stove. The window ends up traditionally placed over the sink, front right. The microwave and our small oven get stacked on top of each other, and there’s a chunk of bonus storage space above the fridge. 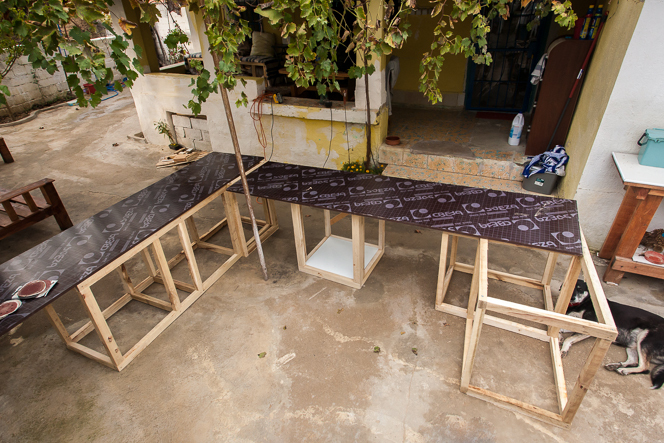 So far, we’ve started on some of the framing work, and found some 18mm plywood to serve as a base for the tiled worktops. We’ve been lining things up out in the courtyard to check that it’s all going to fit. Once we take the pieces into the actual kitchen, there will be a lot less room to move. Kitchen cupboards and worktops starting to take shape. None of the kitchen walls are at right angles to each other, so there’s some fiddly bits with the carpentry. 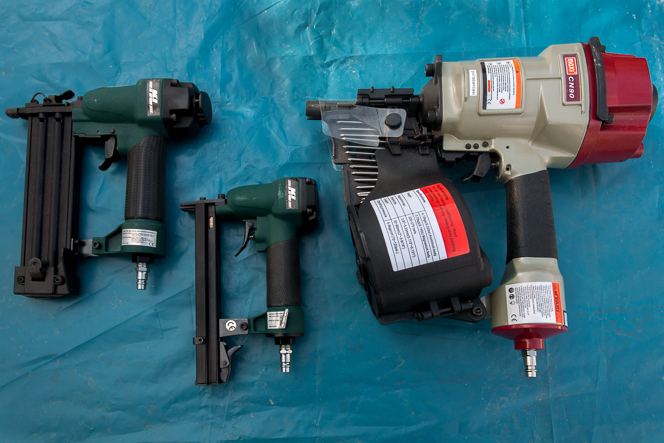 At the risk of appearing to have gone full red-neck, here’s a shot of the nail guns I mentioned last time. They may look excessive but they’ve been extremely handy in putting together framing projects like the kitchen. Of course sometimes you have to use screws, but when you can get away with nails, the power to get twenty of them into the work piece inside a minute is just amazing. The little one, the staple gun, has probably been the big surprise: you can use it to put together something like a mitre-cut picture frame very easily, and it’s great for pinning up wire mesh for plastering. Nail guns: the one on the left fires nails up to 5cm long, and is moderately scary. The one in the middle fires staples deep into timber, and is not so scary but will still hurt you. The one on the right fires 9cm nails and is absolutely terrifying. 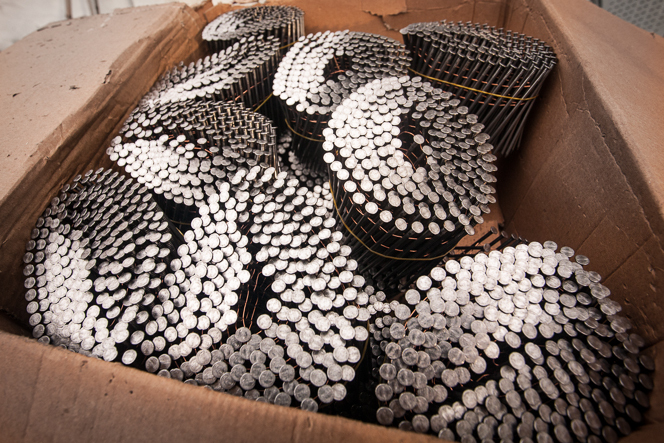 This is what a box of 5000 wire-coiled 9cm nails looks like. I hope not to need to go back to the shop for a while. Last week we put a solar hot water system in. Or, more correctly, we paid the professionals to put one in. Previously we’d been using an instant hot-water heater but that was going to lead to big electricity bills if we kept it up. Solar has been great so far, with plenty of hot water even on the cloudier days. 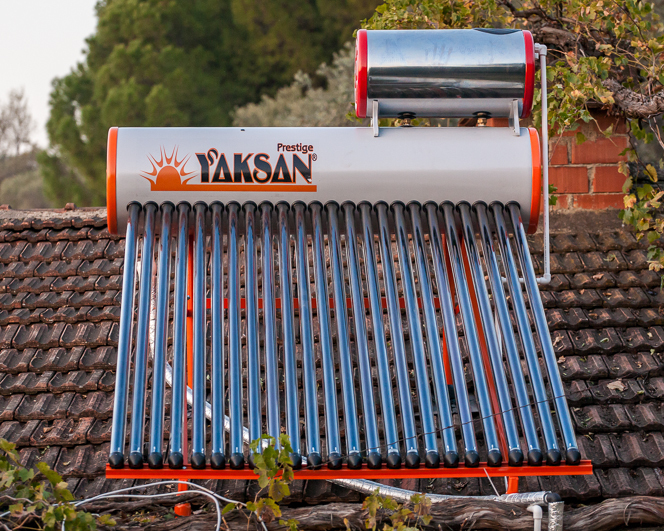 Our new solar hot water system, on the roof above the bathroom. Combined bench and cat box project. 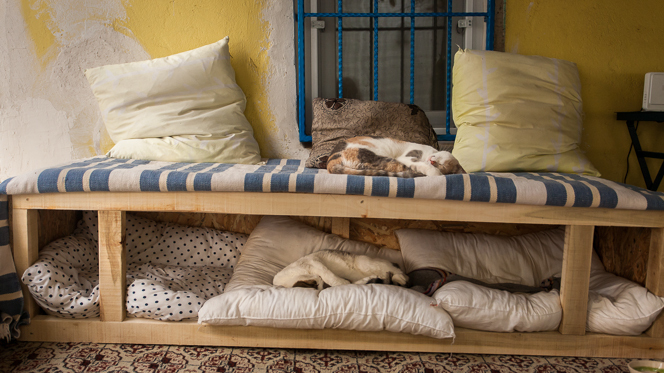 The cats were supposed to sleep underneath so people could sit on the top, but as you can see they had other ideas. The idea was to make a box to keep the cats out of the wind, and to put some cushions and blankets inside to make it comfortable. 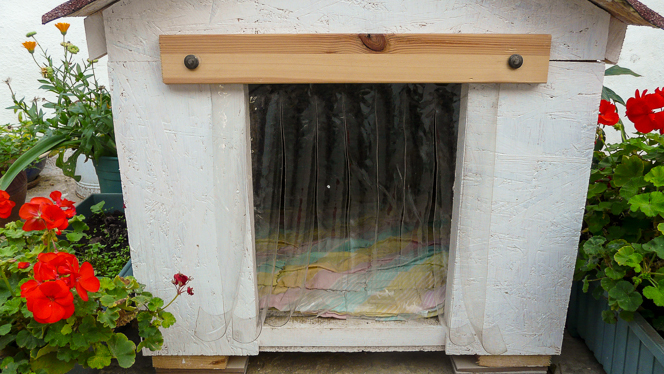 We’ve since put a panel of clear plastic over the middle section to help them keep more body heat in there. They seem to appreciate it. 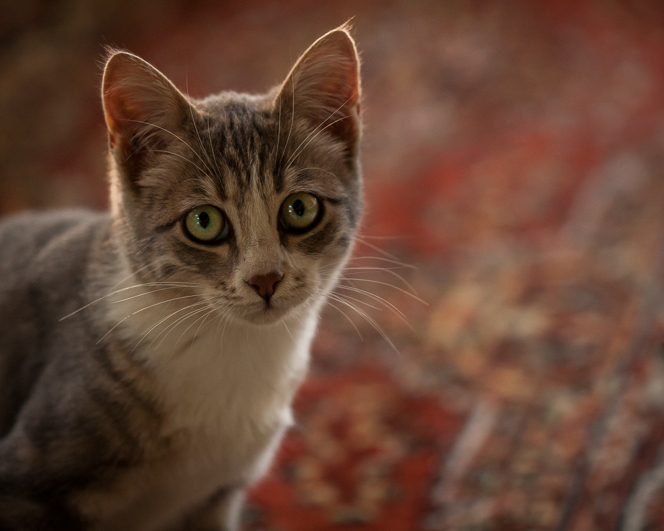 This is Suzi, one of Sütlaç’s kittens. 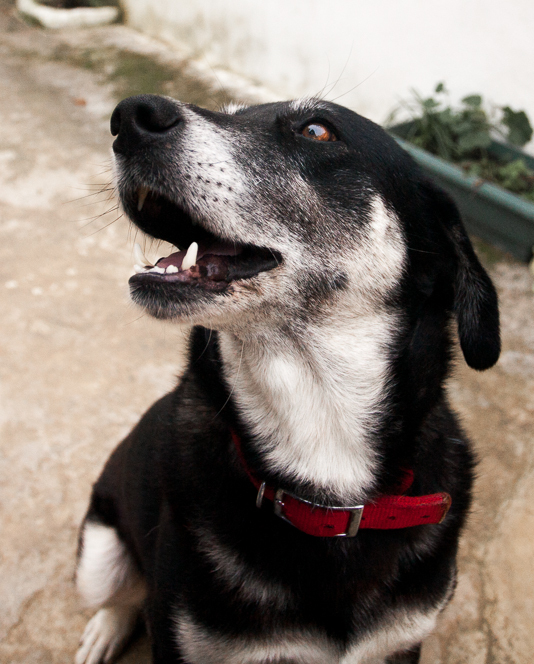 How can you look at that face and not build some kind of shelter for her? Zeytin is shocked to learn that the cats now also have a house. On our way back from a walk today, we climbed the hill across the street to get a new view on our place. 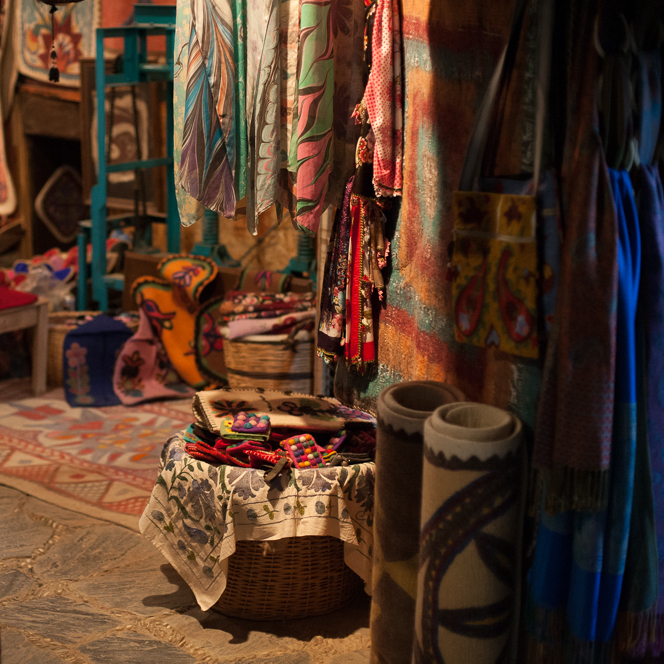 I really like the shot below, because you can see all the different bits and pieces that make up our little compound. From the front left, anti-clockwise, that’s the disused chicken coop, then the old house, the new house, the barn, and, if you look carefully in the foliage at the back, you can see the slab of metal roofing that keeps the rain off our clay oven. Our farmhouse from a new angle. Autumn colours in the village. PS: there is one more thing. We really appreciate all the comments on the blog, but we’ve been a bit surprised to find how prevalent spam commenting is in the blog world. (Probably many of you out there already knew this.) At first I was manually approving or deleting every comment, but when the spam count got into the thousands it became overwhelming. So we’re currently relying on some spam filters that work on keywords. It makes my life a lot easier, but the downside is there’s a small chance that every now and then we’ll block a legitimate comment. If a comment of yours seems to go missing, I apologize in advance, and please feel free to email me and I’ll sort it out. It’s a busy period at the moment. There’s just the two of us here, and we’re trying to get the rest of the renovation done on the farmhouse so we can switch focus to the straw-bale construction up in the orchard. 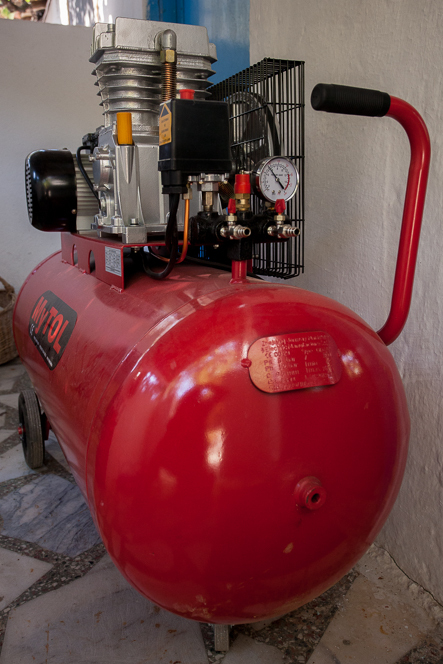 Of all the tools we either brought with us or bought here in Turkey, I think the most useful is the air compressor. I used to wonder what these were really for: why would anyone want a big supply of compressed air? 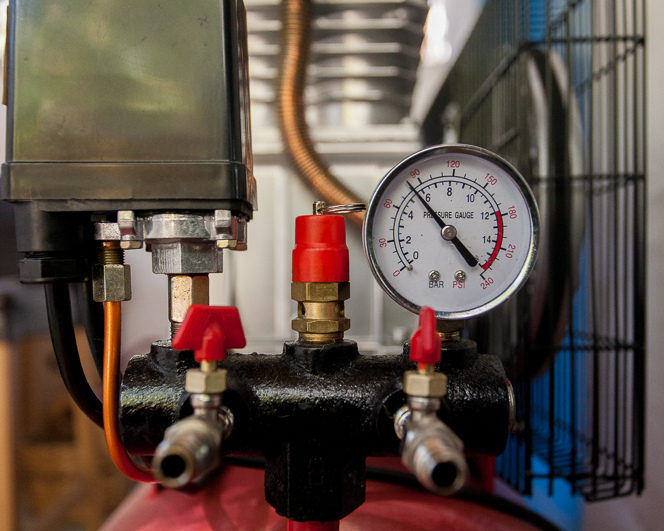 It turns out that the reason you want compressed air is because you can use it to do almost anything. Instead of buying lots of small tools like drills or sanders with individual electric motors, the idea is to have one big electric motor that fills a tank with compressed air, and then use the air to power lighter, simpler, hopefully cheaper tools. Gauges, valves, copper pipes… it’s got everything! In truth, we haven’t thrown away all our electric saws and drills. But the compressor lets us run tools that don’t always have an electric equivalent. The most dramatic are probably the two nail guns we own: scary! We also have an air-powered staple gun which is incredibly handy for things like upholstery. 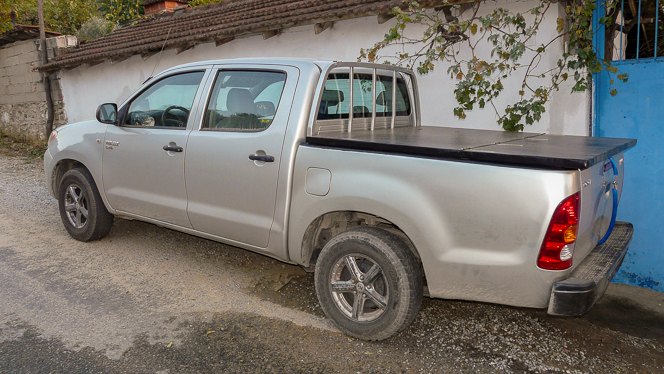 For instance: we like our Toyota Hilux, and it will carry a lot of cargo. But one of its few weak points is that you don’t really have a boot. There’s nowhere to lock up your bags or shopping out of sight. So we built a removable tray cover out of basic timber and board, but made it look more professional by covering it in black vinyl. We wouldn’t have been able to do such a nice job of stretching the vinyl without the power of the staple gun. 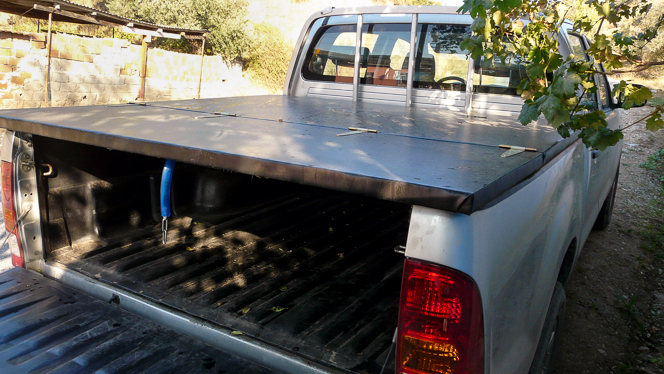 Truck tray cover: timber and oriented-strand board covered in black vinyl. We hope it looks professional. Another air tool that’s going to get a lot of use in the future is a mortar-and-plaster sprayer we had to order from the US. This is going to be a life saver when it comes to the hard work of getting all those straw bale walls covered in three coats of clay plaster. 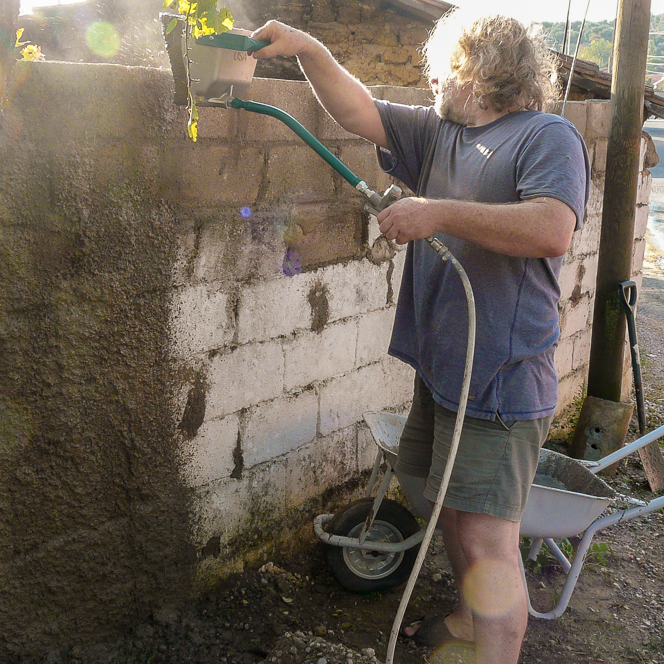 We tried the sprayer out for the first time on a smaller job: covering a brick wall at the front of the house with cement render. 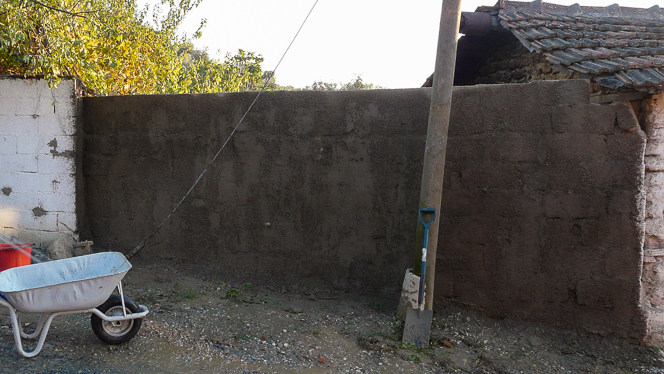 … and then the compressed air blasts the mortar out onto the wall. Rendered in no time; will look much nicer once limewashed. 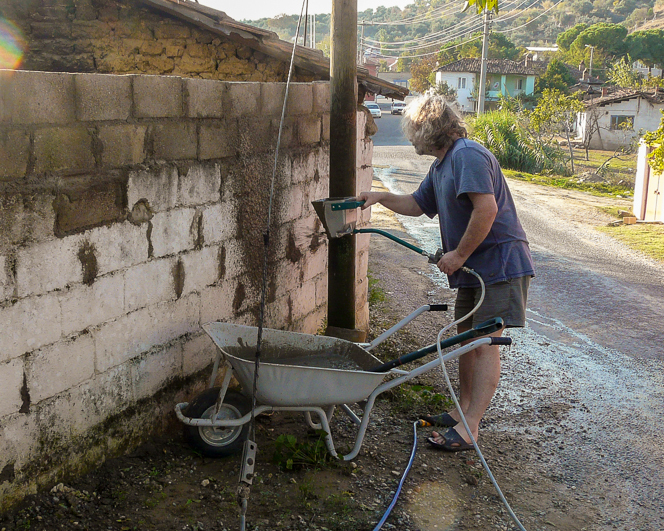 If we hadn’t had to stop and manually mix up additional mortar a few times, the job would have been done in ten minutes. It’s a really smart and simple tool. Speaking of plastering, we’ve also started to experiment with using the clay-rich soil from our orchard as a plaster base. The oven at the back of the garden was looking a bit worse for wear, so giving it a new coat seemed like good practice. 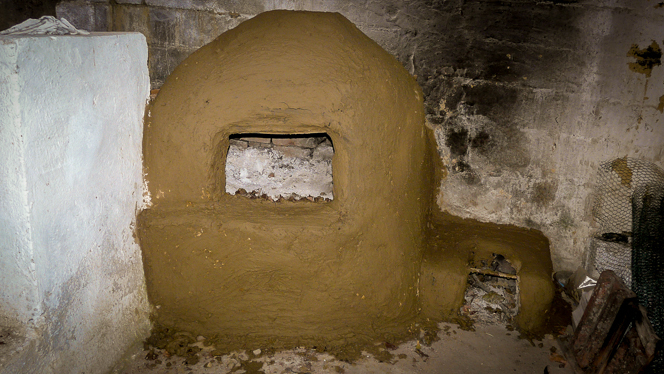 Fresh coat of earth plaster (just dirt mixed with a bit of ash) on the clay oven. In that photo, you might spot some cracks forming in our plaster coat as it dries. That was both frustrating and encouraging: it means that the plaster mix we get from simply digging up our soil is actually too rich in clay. We need to add some sand and maybe some straw and lime to perfect it. Further work needed, as the scientists say. What else have we done lately? We worried that Zeytin (the dog) would not be warm enough as the nights got colder, so we gave her a clear plastic curtain to help keep her body heat inside the doghouse. A curtain to keep Zeytin warm. Yes, we are soft-hearted people, I know. 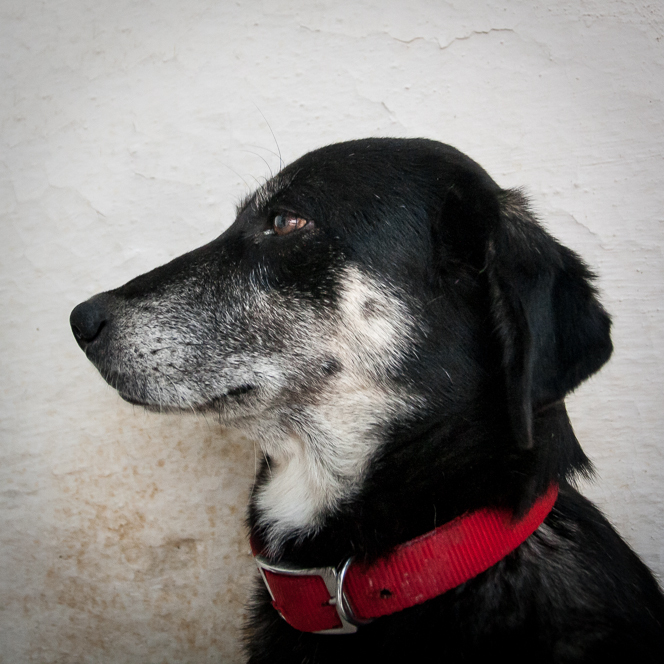 And here is a shot of Zeytin looking like a fugitive in an old “wanted” poster. The next big project is definitely finishing the kitchen. It’s embarrassing how long I’ve put that one off. It’s not that we don’t have a kitchen; it’s just that it’s mostly made out of bookshelves and it doesn’t have a sink in it yet. Thanks for reading. As usual I will close with a random selection of pictures. 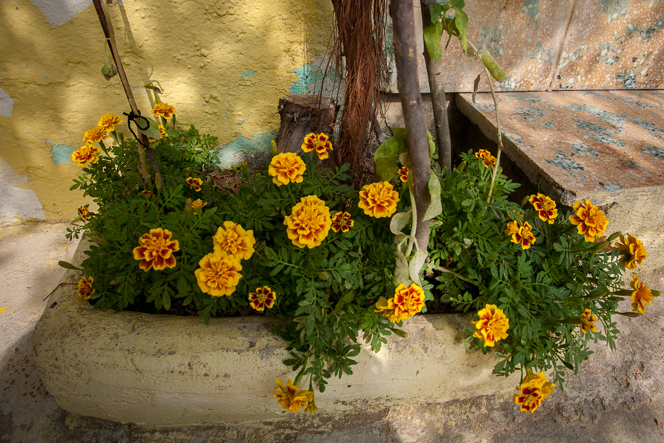 Sirem wanted me to post this shot of some marigolds just to show that they are still in bloom. 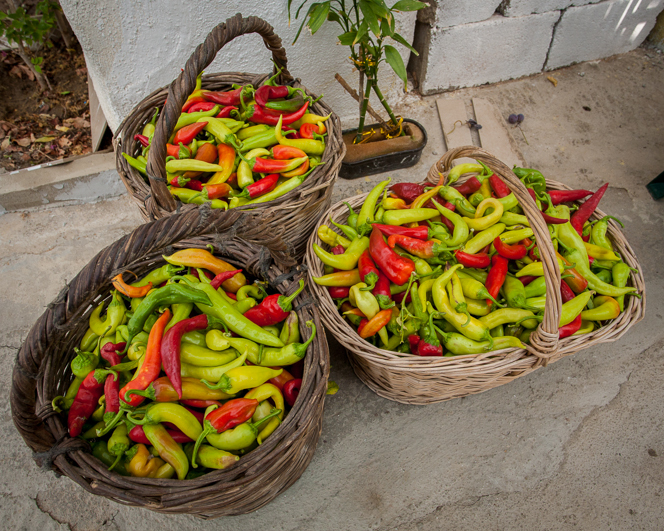 More bounty from our neighbour’s garden: we fried most of these peppers and froze them to use over the winter. 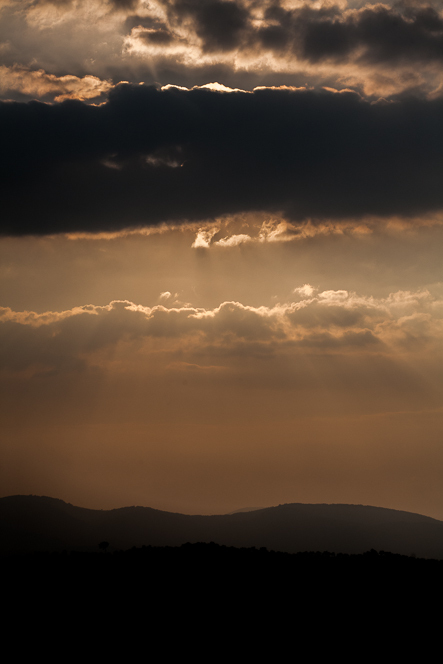 A moody-looking sunset over our village. It’s getting colder now. Late last night the thermometer went into single figures (9 degrees) for the first time. But most days are pleasant and sunny, and we’re pushing on with a long list of projects. Small steps, but we’re getting there. For example, we had a solar hot water system installed on the roof today, and I spent the afternoon pulling down the last of the old shed so we can re-use the bricks to make raised beds in the garden. Still, that kind of activity doesn’t necessarily lead to good photos. So I’ve decided to use this post to show you more of the beautiful towns and landscapes we’ve found on our days off, touring around what was once Ionia. 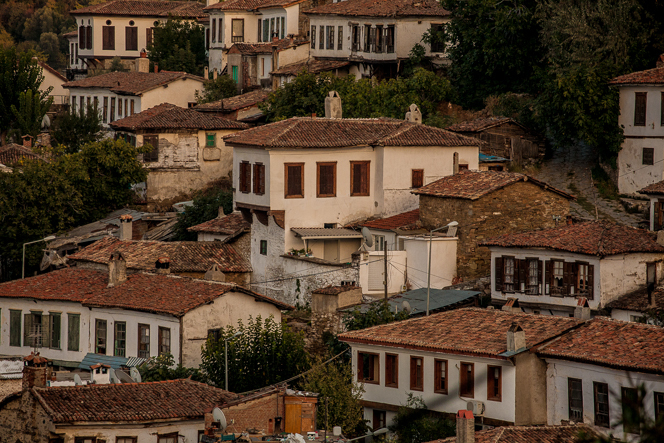 First, Şirince: this pretty town in the mountains is very popular and worth the drive up from Selçuk. 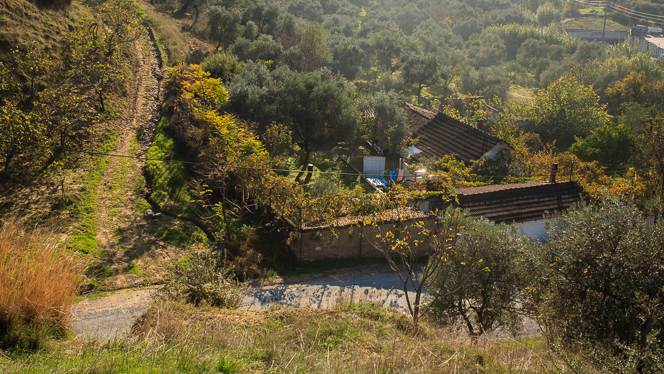 Local mythology says it was founded by escaped slaves from Ephesus. Until 1926 it was called Çirkince (“ugly”) which was apparently a strategy to discourage too many visitors. 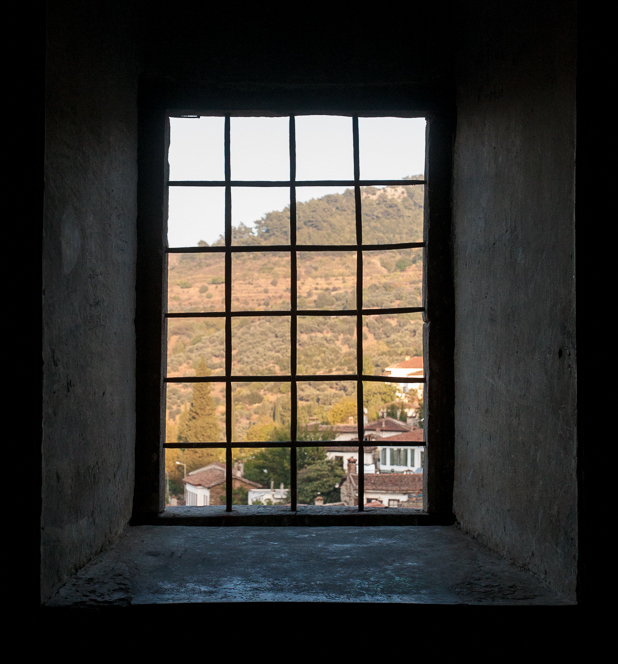 View from the window of the old Byzantine church. Looking across the rooftops as the sun sets. 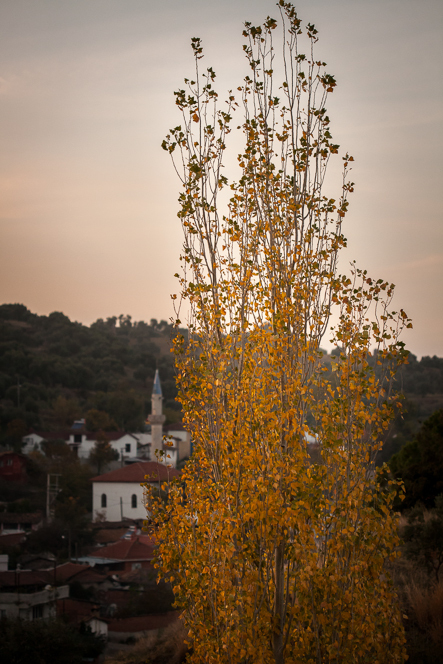 On another trip we visited some friends who were staying in the much quieter village of Eski Doğanbey, on the south side of the Dilek National Park peninsula. 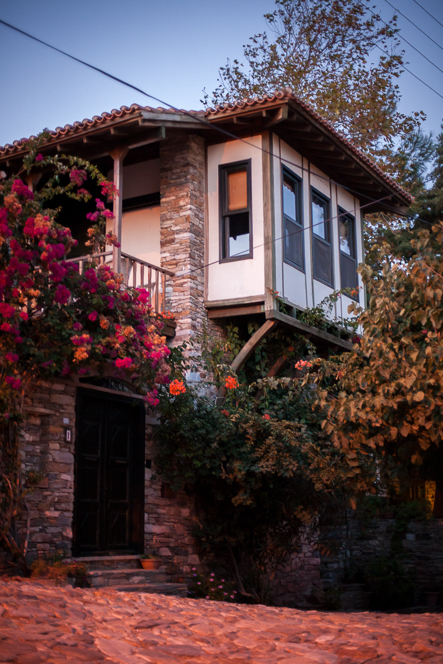 This place has a similar Greek heritage to Şirince. 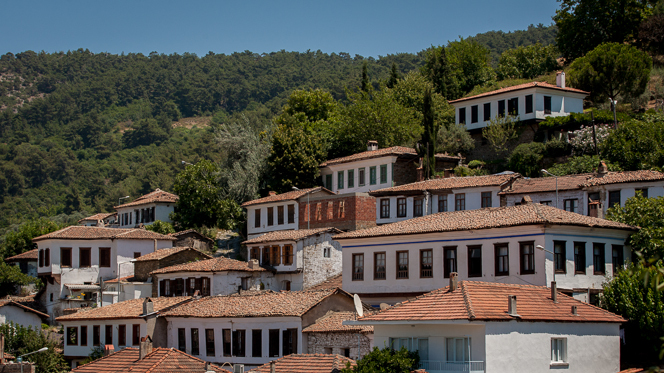 Both villages were inhabited by Greeks during Ottoman times, and it was only in the earliest days of the new Turkish state, during the population exchanges of 1923, that Turkish farmers first moved in. 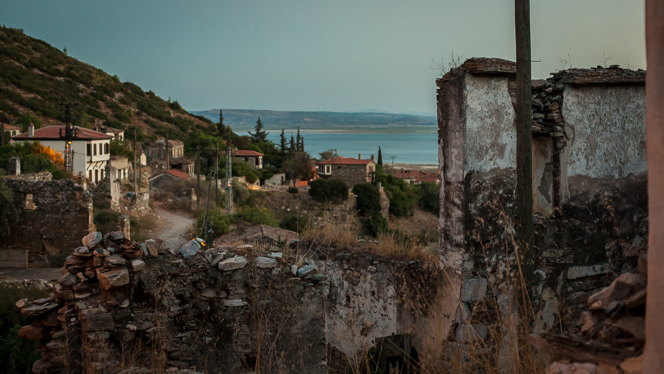 In Eski Doğanbey those farmers found that they preferred working the flatter, more fertile land down in the Menderes valley, and so the town was abandoned for many years. 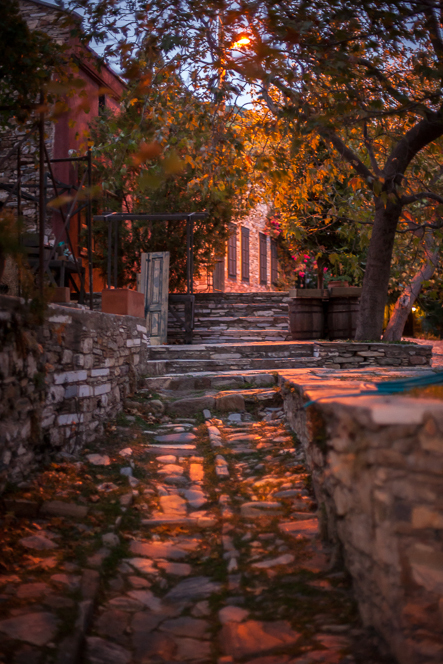 In recent decades people have started restoring the traditional stone houses, but the village remains a quiet place to get away from everything. Looking south from Eski Doğanbey to the mouth of the Menderes and the Aegean sea. Restored house with fantastic bay window. Streets of Eski Doğanbey by moonlight. We also returned to the mountains behind our house. We tried a different road this time, east to İncirliova (halfway to Aydın) and then north, across the hills to Tire. It is very special up there. Pine forest, lake, and sweeping views in the mountains. Top left shows geological strata in a road cutting; bottom right there’s a tiny farmhouse. And finally, the latest animal-related drama: we always suspected that Sütlaç had had a litter of kittens in summer. They must have been under our noses all along, as the three of them are now living in the field across from our house, and we’re feeding them regularly. 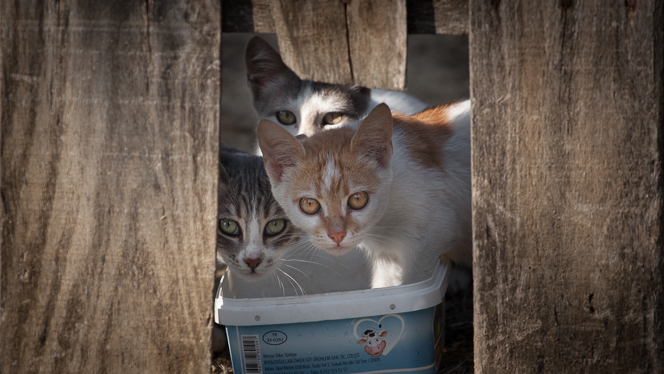 Aydın has a shelter for dogs, but there’s nowhere to take cats, so the responsibility is on us. They’re just a bit too timid to allow themselves to be picked up (yet), but are very sweet nevertheless.